The drive to improve comes from within. Is it raining? That doesn’t matter. Am I tired? That doesn’t matter. Then willpower will be no problem. Running is healing. Running brings people together. Running inspires. Running is community. Hello ladies, here is the latest news from the “nest”! I often get comments like “I can’t believe you don’t charge anything for your programs” or “It’s a nice thing you are doing with your group” when I tell people about Nik’s Chicks. There are many reasons why the group was formed but last night’s work out brought to the surface one of the main ones – I like to be that catalyst for getting women out of their comfort zones and challenging themselves in a new way. Last night I sprung the idea of doing repeats on the group. My dangling carrot (because I knew there would be some objections) was that they would actually be covering a shorter distance than usual… and it worked:) Seven of us jogged over to Abbey Park HS track where we sprinted 400m followed by a 200m walk, repeating it 5 times. After the first repeat there was lots of feedback like “That was harder that I thought it would be!”. The troop hung in there for 4 more repeats and we all finished with huge smiles. We jogged back to my place feeling like we came, we saw and we conquered! The session reminded me how empowering it is for us to simply do something more difficult than the things we typically do in the run of a day. None of the ladies was particularly “gung ho” prior to the workout, but all of them felt great afterwards. My advice for this week: Don’t shy away from taking risks. You learn a lot about yourself when faced with new and daunting situations! Are there any ladies who will be training for the Oakville Half Marathon on September 27th or the Scotiabank Half Marathon on October 18th? If so, let me know! These training programs would begin on July 4th and July 25th respectively. I have heard from a couple of ladies that the Oakville 1/2 is on their radar. 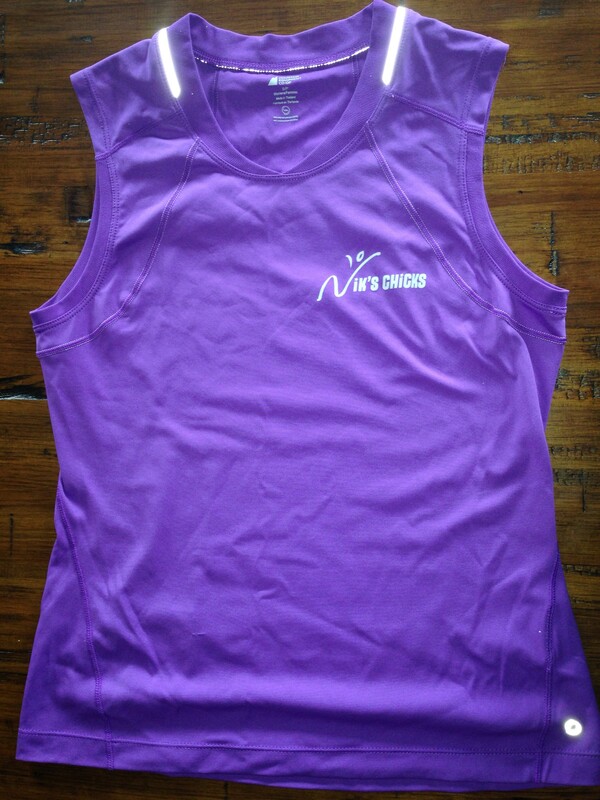 Tank Tops: We have finalized the design for the sleeveless tops and are ordering next week. They are made of a highly breathable fabric which is great for summer running, not just triathlon. The fit kit has arrived so you will have a chance to try on the samples. I will have try on sessions after each run for the next few days – til Sunday June 14. Please try to make one of these times so I can get the order in by June 15th. If you can’t make one of these times but would like to try on the shirts, please contact me to arrange a time to drop in. They don’t run as small as the jackets – I have chosen a medium! ! The price point will be dependent on the number of tops ordered. We will need a minimum order of 18 units – currently sitting on 10. 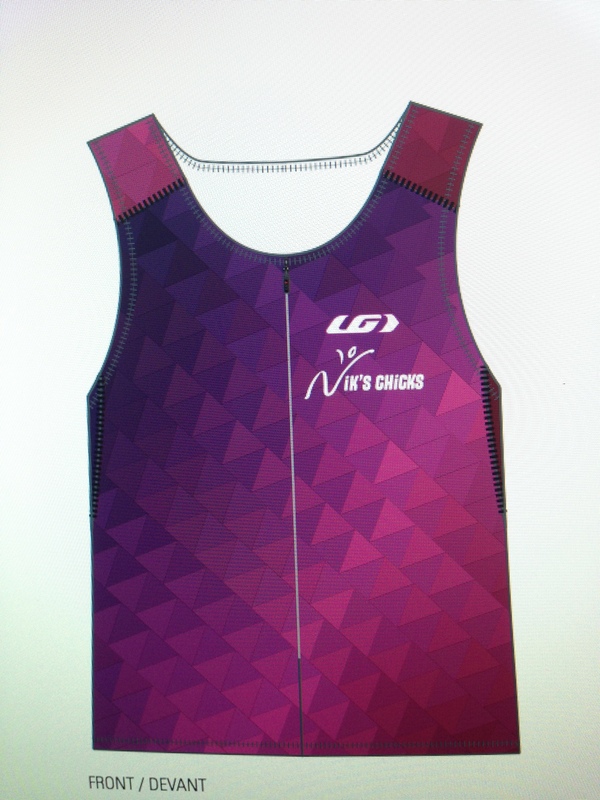 (18-24 = 70.00, 25-49 = 59.00) Here is a link to the Women’s Delphino Racer Top Louis Garneau Tri Top for more specific info including sizing chart. Similar technical tops usually retail for 90.00-110.00. Even at 70.00, it’s a good price point. Consider it an investment piece!! I will send out online ordering instructions early next week. Good Luck: Best wishes to the Ladies doing the Nike Women’s 15km on Toronto Island this weekend. I’m looking for a post-race report to see if you recommend it to do next year! Motivational Video: This one gets you thinking, for sure! 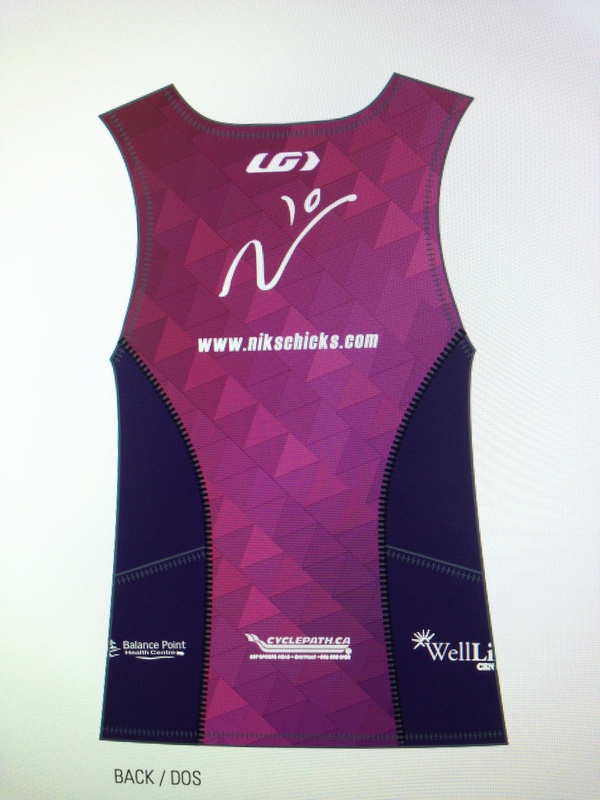 Nik’s Chicks Gear: If you want some official Nik’s Chicks merchandise, check out the running tops (20.00) and hats (25.00) that I have “in stock” – limited sizes left in the tops! Perfect for summer! Kelso Open Water Swimming: Jo and I (along with honorary Chicks Tony and Martin), will be heading to Kelso on Thursday evenings and Saturday mornings. If you are looking to carpool with us, please contact me the day before so we know ahead of time. Tips From Runner’s World Daily Calendar 2015: 1) Not every run is going to be great. There will be days when it feels like your legs are filled with cement. Here’s one trick for when you can’t seem to shake the tension in the first few minutes into a run: Pick a road sign and increase your speed until you reach it. 2) To run faster, add speedwork and longer runs into your weekly routine. The speedwork helps build your aerobic fitness. Longer runs improve your ability to deal with the stress of a hard workout. Take a day off after speedwork and long runs so that your body can recover. 3 ) While it might be nice to get out during the day for a lunch run, during the summer it’s best to avoid running between 10 and 4. Instead opt for an early morning or evening run, when the sun’s rays aren’t as strong. 4) Sometimes, run without all the gadgets. Running based on feel rather than time allows for variations in weather, wind and terrain. The body doesn’t know pace, it only knows intensity and duration. Tuning into that is really important. 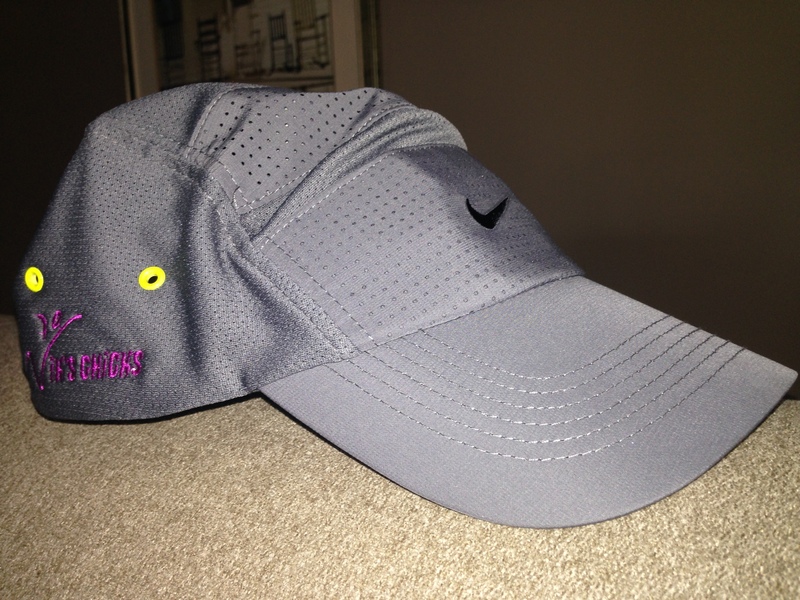 5) Wear moisture wicking cap and clothing in light colours to reflect the sun.